The Mt. Zion High School Athletic Department and Booster Club recently inducted four members into the Mt. Zion High School Shining Eagle Hall of Fame. The Hall of Fame honors those who have made outstanding contributions in athletics, academics, arts, faculty and community service. 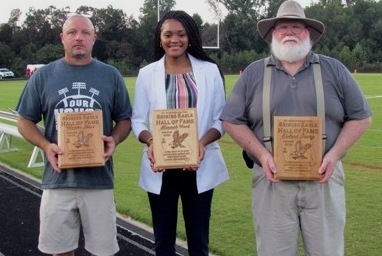 The 2018 inductees were Mr. Wayne Jiles '87 (School/Community Booster), Miss Hannah Wood '12 (Female Athletics) and Mr. Eldred Perry '74 (Male Athletics) and Mr. Bradley Ashley '79 (Academics/Arts). Pictured left to right are Mr. Wayne Jiles, Miss Hannah Wood and Mr. Eldred Perry.